BOSTON, MA – The Under Armour Cape League All-Star Game will take place on Thursday, July 23, 2009 at 7:05 p.m. at Fenway Park for the first time in 22 years. The game will be broadcast on the New England Sports Network (NESN) and will feature a Home Run Derby prior to the game. To purchase tickets, fans can log on to www.redsox.com/capecod or call (877) REDSOX-9 beginning at 10 a.m. on Wednesday, April 15, 2009. Fans with disabilities may call (877) REDSOX-9 to purchase accessible seating (while supplies last). The Red Sox' TTY number for hearing-impaired fans is (617) 226-6644. Tickets are all general admission and priced at only $10.00 a ticket. The day will also feature an autograph session with the all-stars and family entertainment in the Fenway Park concourses. Discounted concession items will also be available. The 2009 game at Fenway Park will be the 45th in the league’s “modern era” and the 22nd using the present East Division vs. West Division format, which began in 1988. Since that year, the record stands at 11 wins for the East, nine wins for the West and one tie. The East has won the last six in a row and eight of the last nine. Last year’s game was hosted at Veterans Field, home of the Chatham A’s of the Cape League, and was attended by 8,629 fans. Prior to the East vs. West format, the Cape League All-Star game featured the entire Cape League All-Star roster on a single team against the Atlantic Collegiate Baseball League. In 1987, the Cape League All-Stars defeated the Atlantic Collegiate Baseball League All-Stars, 10-1, at Fenway Park in the final installment of the CCBL-ACBL series and the last Cape League All-Star game hosted at Fenway Park prior to 2009. 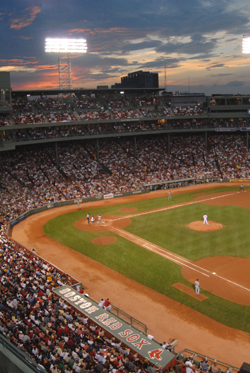 In all, seven meetings between the CCBL and ACBL All-Stars took place at Fenway Park – in 1975, 1977, 1979, 1981, 1983, 1985 and 1987. The Cape League won six of those games and the 1981 contest ended in a 4-4 tie. The Cape League, founded in 1885, is celebrating its 125th season in 2009. The League traces its roots to July 4, 1885, when a “base ball” game was played in Sandwich, Mass., between teams representing Sandwich and Barnstable (proclaimed on a poster in the Hall of Fame in Cooperstown). The league’s so-called “modern era” began in 1963 with the merger of the former Upper Cape and Lower Cape Leagues and the appointment of Daniel J. Silva as commissioner. Since its inception, many Cape League alumni have gone on to the Major Leagues including numerous Red Sox. Current members of the Red Sox who have played in the Cape League include Jason Varitek (Hyannis 1991 & 1993), Kevin Youkilis (Bourne 2000), Jacoby Ellsbury (Falmouth 2004), Javier Lopez (Falmouth 1997), Justin Masterson (Wareham 2005), Mike Lowell (Chatham 1994), Jason Bay (Chatham 1999) and Mark Kotsay (Bourne 1994).